Here are two of my vintage quilt tops that I love a lot. These are perhaps the oldest in my collection. Beware–if you stare at these too long, your eyeballs might start to wiggle. I decided to photograph them as tops and not quilts, since I don’t know when I will have a chance to get them quilted, and also because I might sell them and want to remember these two beauties. 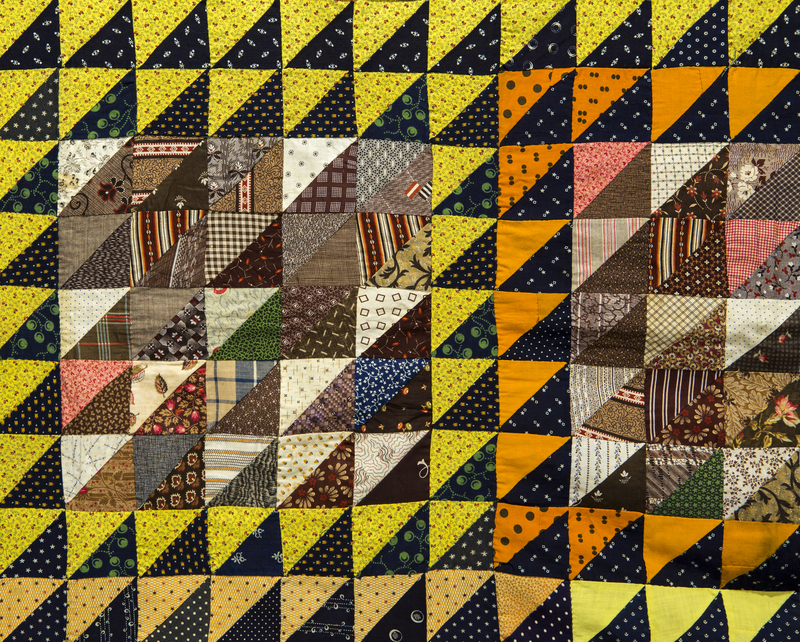 When looking at the detail photograph, I can see the really wonderful fabrics used in the half-square triangles of the main blocks without the distraction of the yellow and the cheddar overwhelming them. 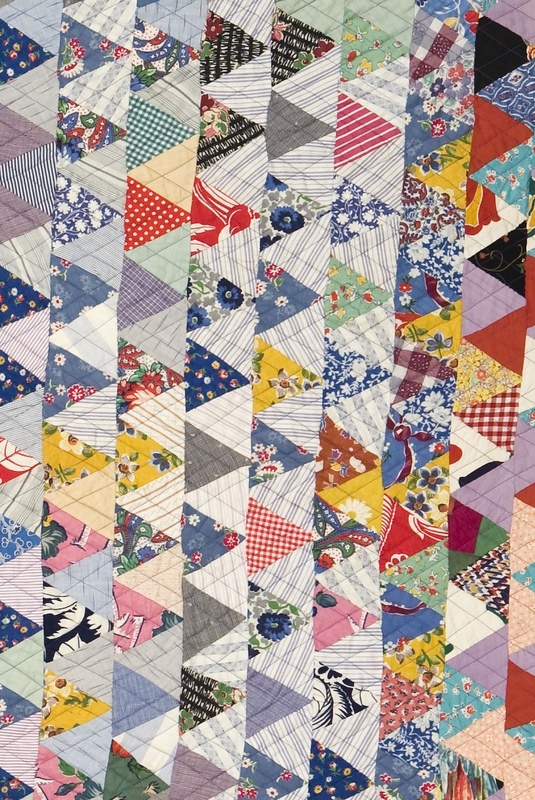 The second quilt top is a postage stamp pattern with really fabulous fabrics playing with each other. 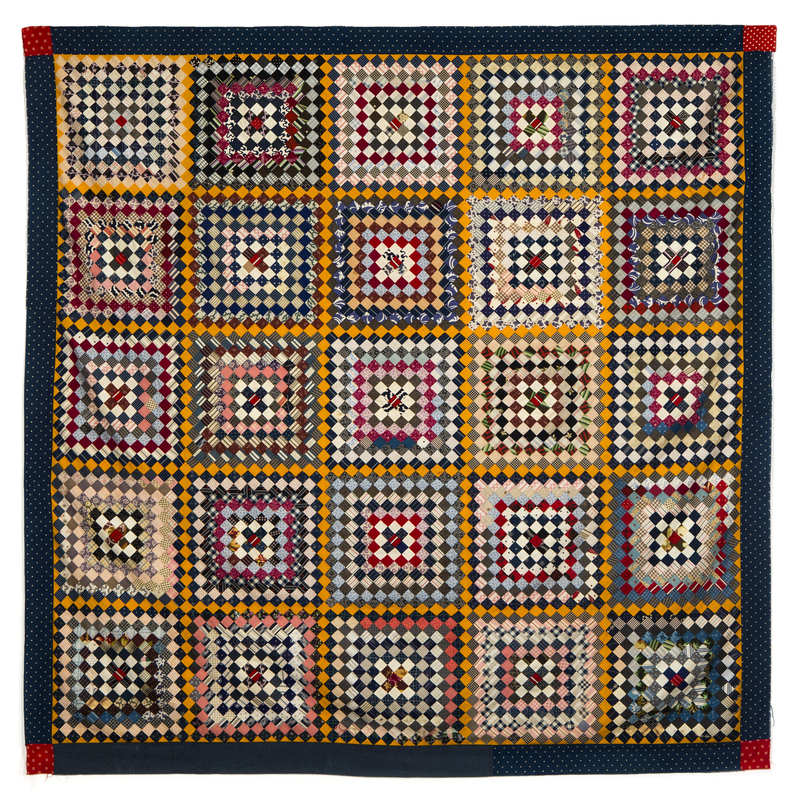 Included in these small blocks are many lovely plaids and stripes. 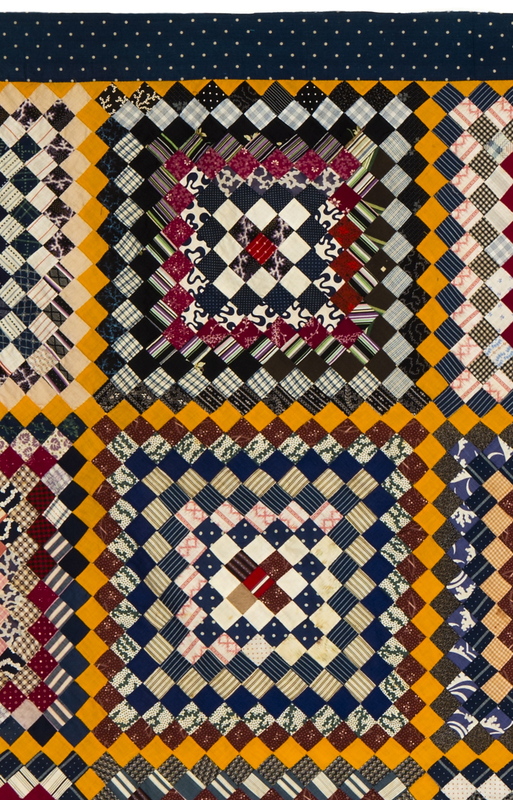 The plaids and stripes coordinate so well with each other..
I’m beginning to understand why I really like the Civil War reproduction fabrics, since they have much the same character as these authentic vintage fabrics. 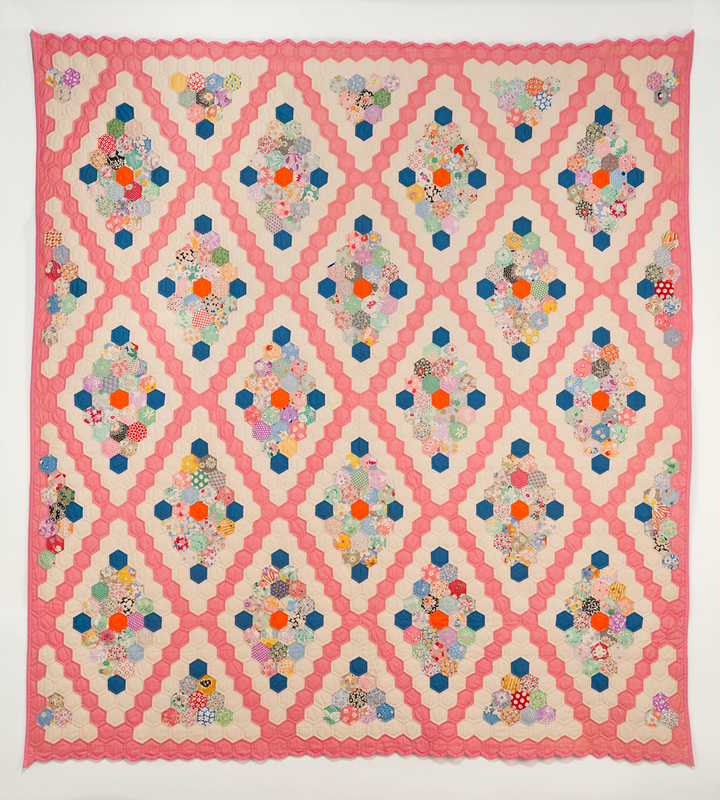 I fell in love with this quilt top when I found it in 1994 in an antique collective in Rockford, Illinois. According to Barbara Brackman, this block is a Rob Peter to Pay Paul variation of the familiar Drunkard’s Path block. 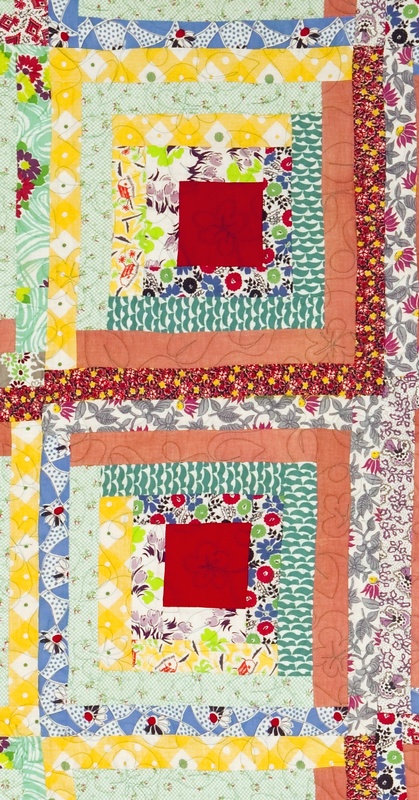 All the very bright colors make this a very happy quilt, and it is one that we use. 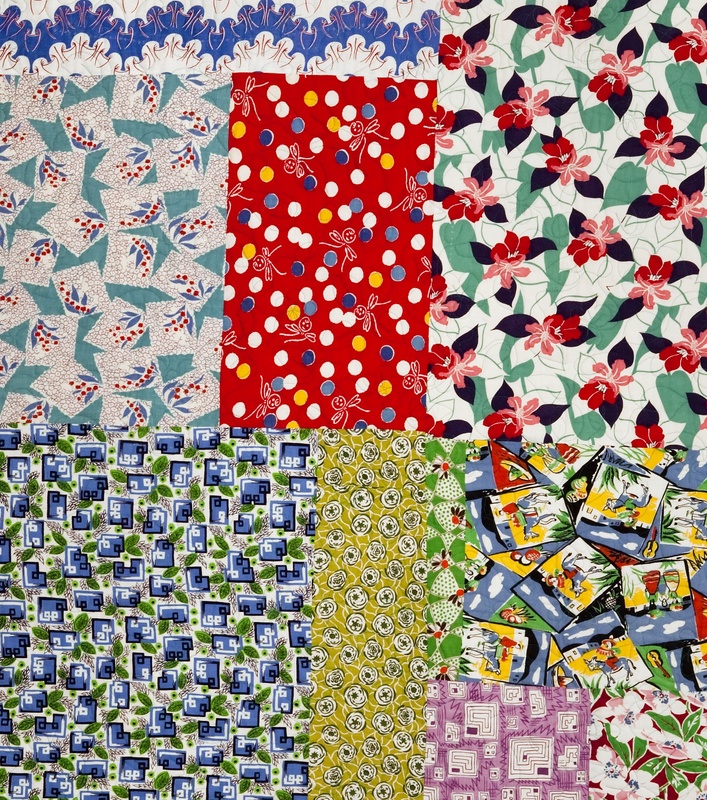 I replaced five heavily stained blocks with ones made from vintage fabric in my stash. Two of the blocks I replaced are pictured here, second and third down. 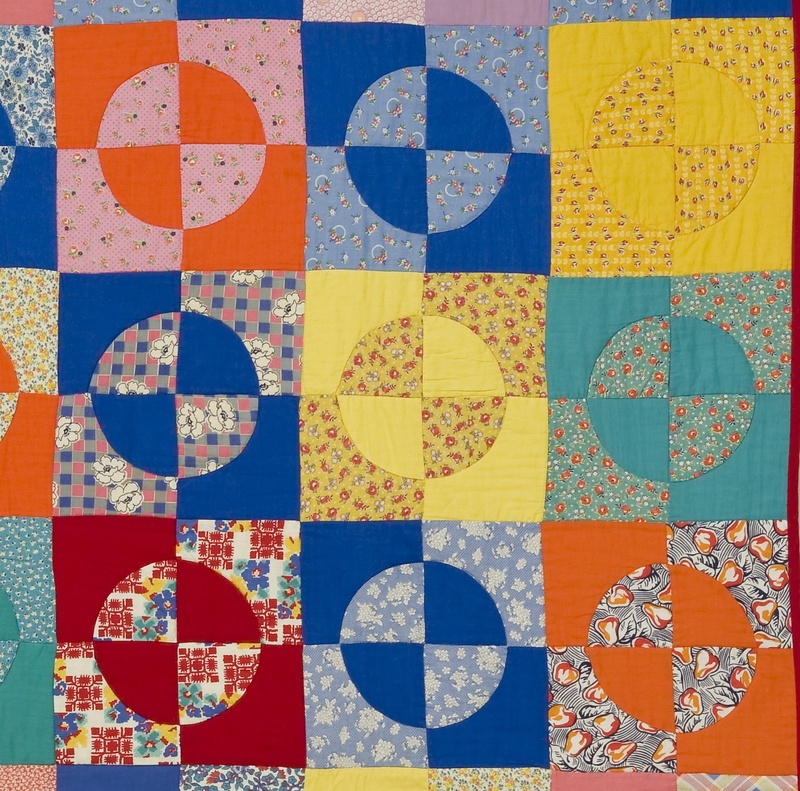 This 1994 quilt also represents the beginning of my long and still-continuing process of learning machine quilting. I see here that all I was able to do at the time was outline each of these blocks in the ditch. Gotta start somewhere. Another from my vintage quilt collection, this former fan quilt top is now a quilt. It is filled with really great vintage fabrics, some of which are strikingly unusual, and I wish I had a few yards of some of these. These complementary colors of lavender and bright yellow create a very strong contrast, and provide a good background for these great fabrics. This detail shows some of the great fabrics. This is a great quilt for the summer. Also, if anyone interested in owning one of the cross-stitch pieces from the previous posts, contact me for details. 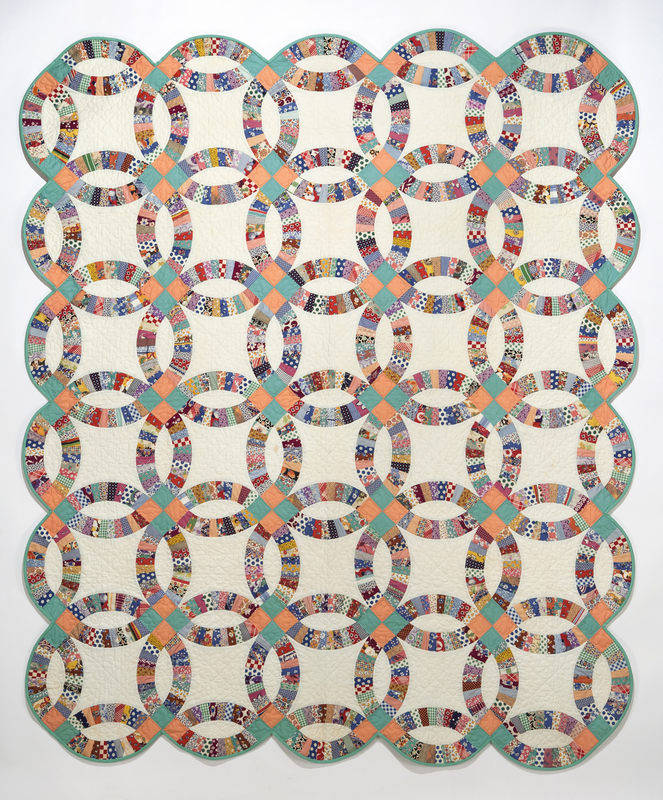 Another quilt from my vintage collection, this large Double Wedding Ring quilt shows a wonderful array of vintage fabrics, held together by the jade green and pale orange dancing four patches. This is another of the quilt tops I purchased, and it was a bit wonky, which may have been the reason for its never having been quilted before now. 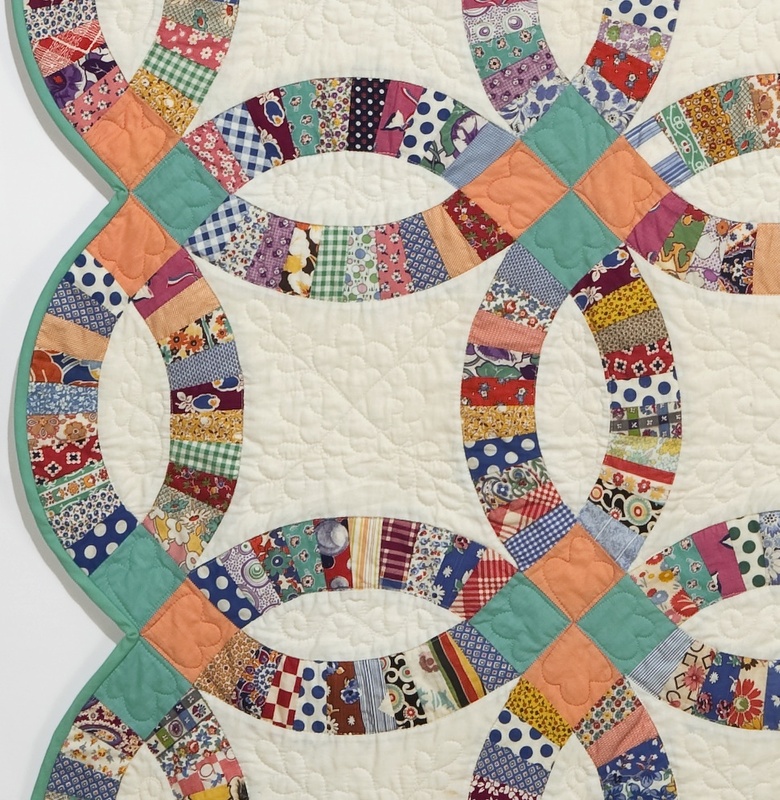 Melissa Quilter took on the challenge of making it all work, and her quilting detail does this one proud. Click on the photo to see a closer view. It has been a long time since I have bothered to fuss with a curved binding like this, but I think it really makes a statement. I was pleased to have found a new Kona cotton that is almost a perfect match to the original from 70+ (?) years ago. 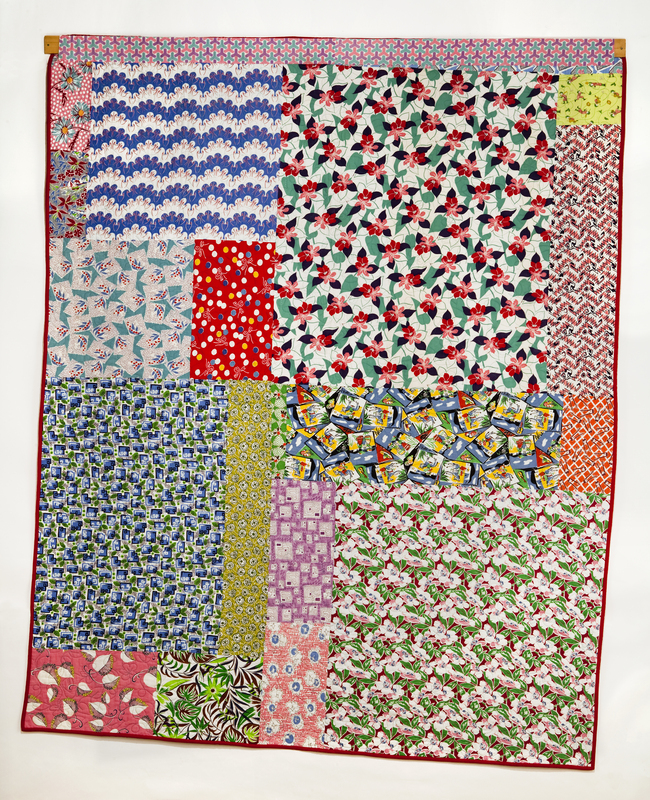 Since it is so bright and cheery, this quilt has been a nice “summer” quilt for the house. I could not resist this fabric at my local shop; I really never know what will catch my eye, and this one turned out to be perfect for a shirt for my brother Dave. 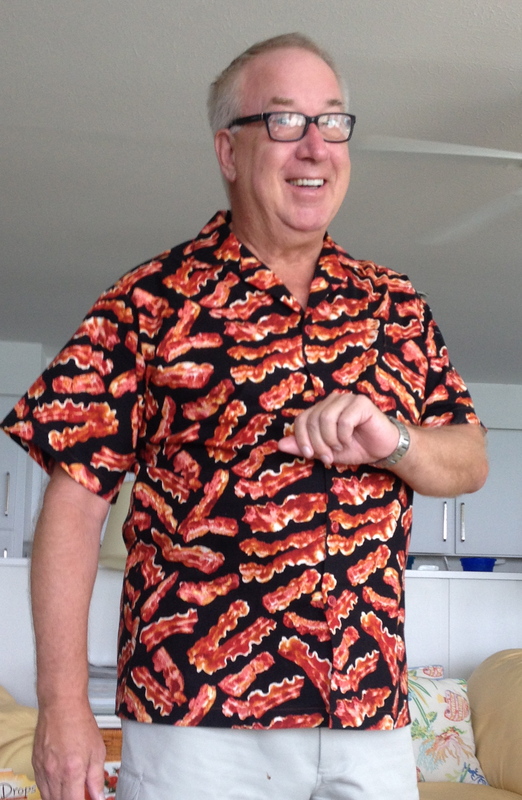 There is a possibility he might actually wear it on occasion. 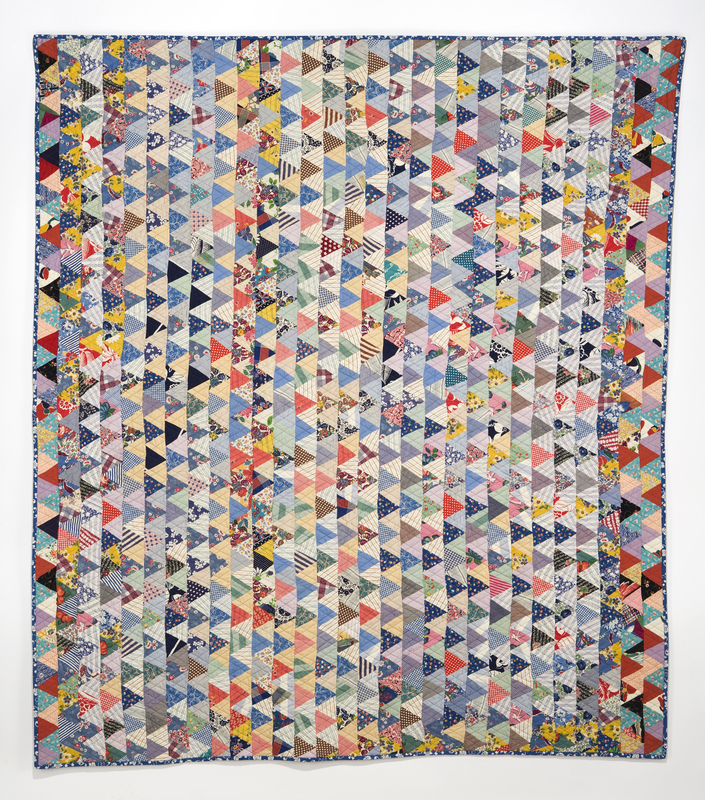 Blue Triangles is another from my vintage collection of quilt tops that have been made into wonderful quilts that we use. As I have described before, I love to complete the work of someone who has come before me; it feels right somehow. The pattern is a Thousand Pyramids variation, set sideways. Using a slightly different dark/light arrangement, it would be Streak o’ Lightning or Lightning. 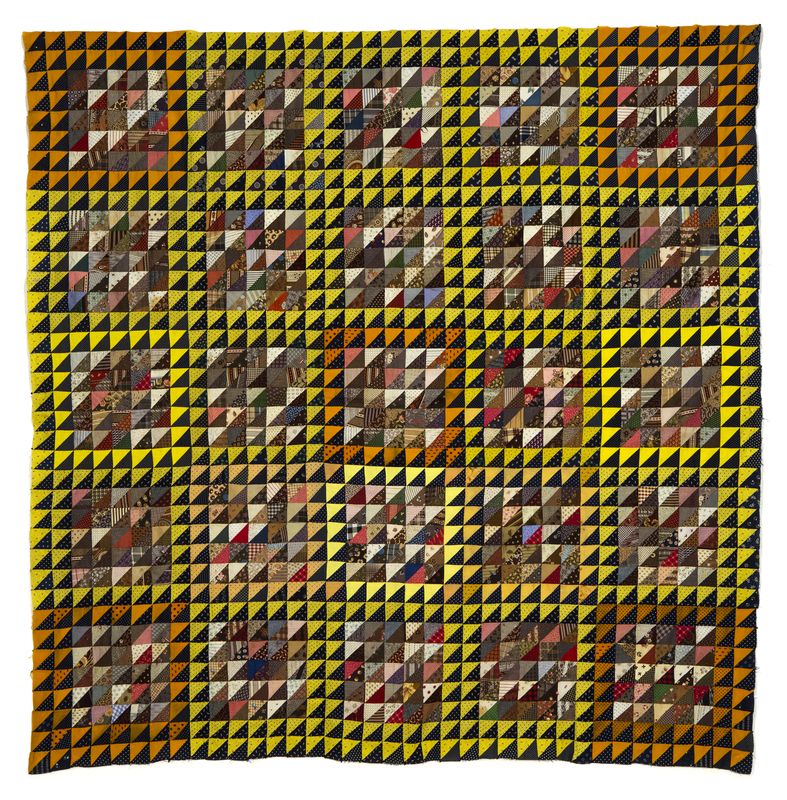 Almost all of the lights in this quilt are vintage men’s shirtings. And I am just guessing that at some point it needed to get just a little bit wider, and additional scraps were found. I used this quilt top to help me learn to machine quilt, managing to quilt the whole thing without marking. Remember the wheels from the Wheel Medallion in the most recent post? In addition to the many other preconceived notions I had regarding that quilt, I also thought it would have a snaky border of these fan sections, but that did not turn out to be the case. Sooooo, I had 28 of these block parts leftover. I LOVE leftovers, because they challenge me to solve the puzzle of dealing with them. So here is a glimpse of how I am working on with them. Seriously, people: Never throw anything away! I recently fell into the abyss that is Pinterest. 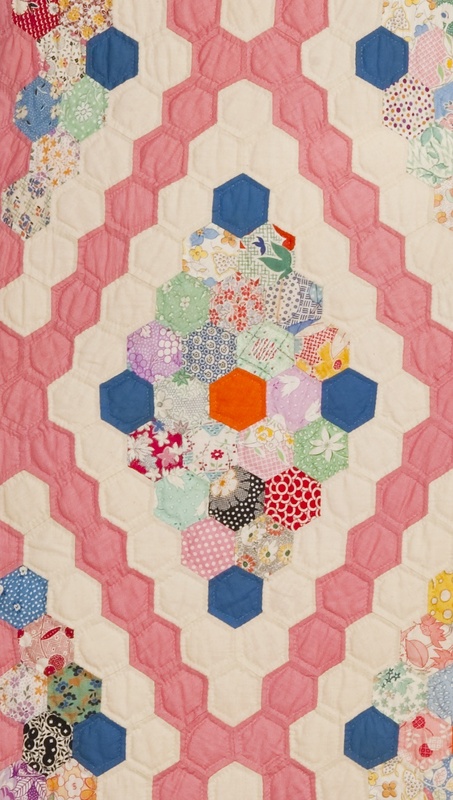 I searched “hexagon quilt” and lost an hour looking at all the fabulous pictures of vintage as well as modern quilts using hexagons. Very, very inspiring . . . almost as much fun as the paper pieced diamonds. 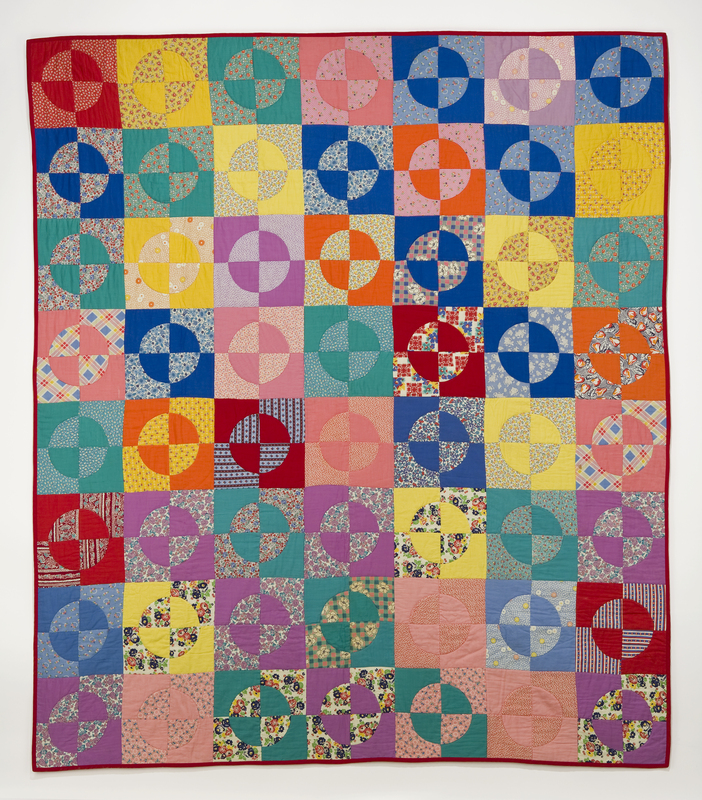 This fall inspired me to post another from my vintage collection, this variation on the traditional Grandmother’s Flower Garden quilt pattern. 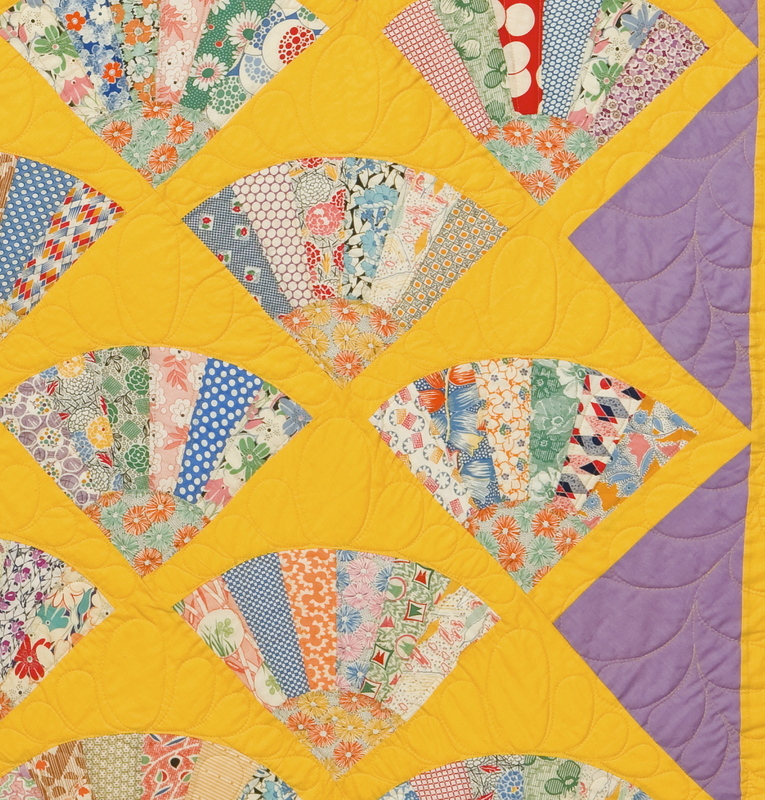 This detail shows the wide variety of 30’s fabrics used, as well as the nice hand quilting by Quilting Plus. I remembered hearing that the hexagons that separate the “flowers” or “diamonds” in a Grandmother’s Flower Garden were called stepping stones, but I cannot find that fact through quick research. Perhaps the “stepping stone” label is used when these motifs are separated by diamonds instead of solid hexagons. I’ll continue my research and update as necessary. In the meantime, I’ll just enjoy using these fun quilts. 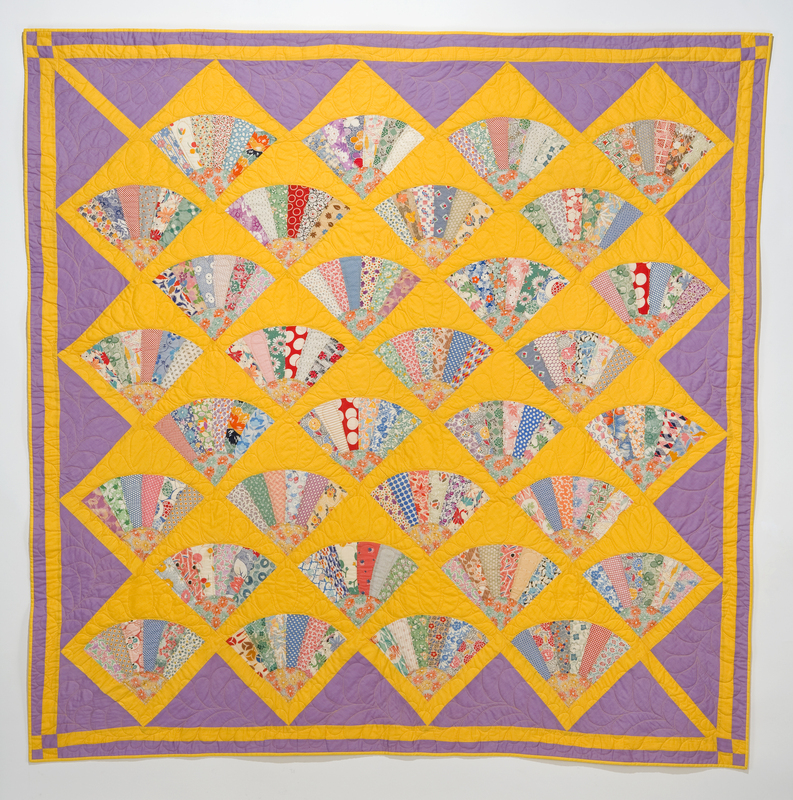 Made from another of the vintage tops I had collected, this quilt is made almost entirely of feed sack fabrics. 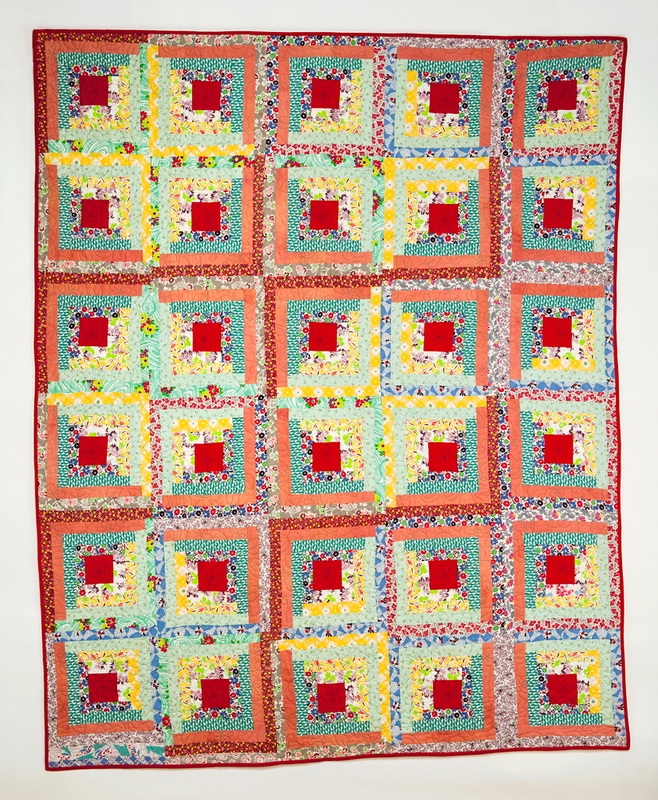 The red centers of the blocks give a big punch to this quilt. Unfortunately I have no record of when I got this top; it may be another from Eli Leon. Regardless, I know I waited a long time before I had it quilted, and when it was finished by Nina Farrell, I saw how wonderful it really was. Also quite wonky, this quilt’s appeal for me is not in the precision of the sewing, but in the fabric. I know I’m nuts, but I love these old prints. 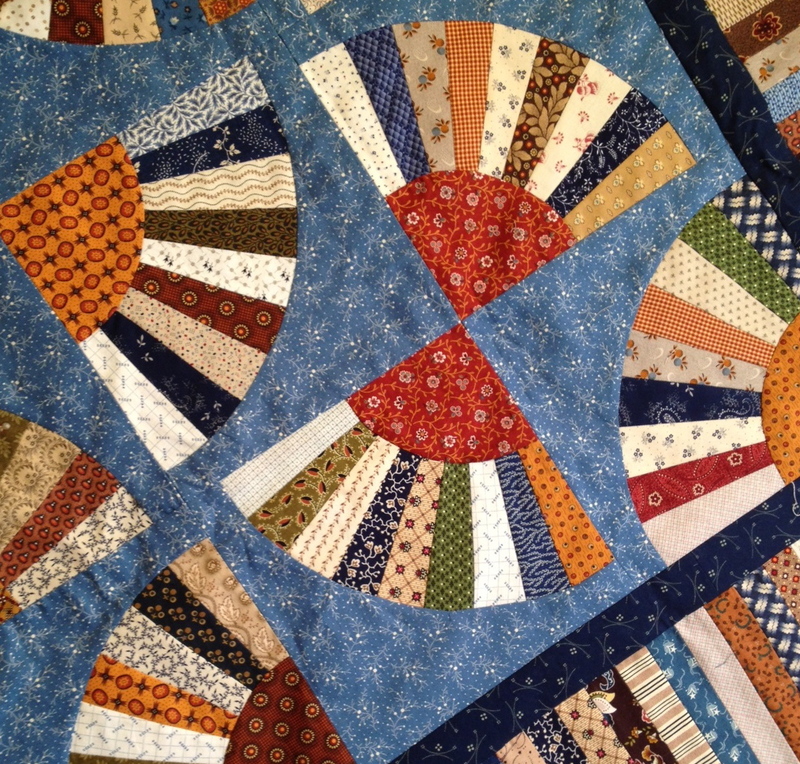 Here is a detail of the machine quilting done by Nina Farrell, who got one of these lovely flowers in each red center. For the back of the quilt, I used feed sacks and feed sack scraps from my collection. I tried to use the wildest prints I could find, so they could be showcased on this big back. Click on the photos to enlarge, and also see the detail below of some of the prints–crazy, crazy stuff. All photography by Sibila Savage unless otherwise noted.